"Ambajejus Point, Old Boom House Exterior "
This is a scanned image of a black and white photograph of the old boom house at Ambajejus Point in Ambajejus Lake in central Maine. 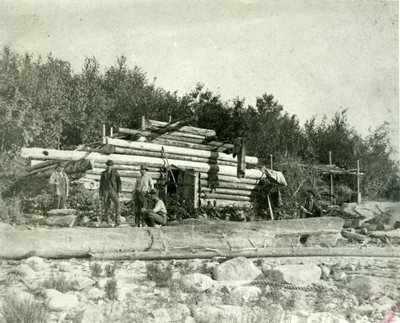 Several men can be seen outside of the wooden structure. The photograph is not dated.